With Transformers: The Last Knight especially, the Transformers franchise went up in flames. Critically, the films have been failing for years, but somehow they've still managed to be billion dollar movies each. But The Last Knight signaled a change. Once again, the film got terrible reviews, but it also underwhelmed at the box office, making only $600 million dollars worldwide. For reference, its predecessor, Transformers: Age of Extinction, made $1.1 billion dollars. So after a $500 million dollar drop at the box office, Paramount has scrapped a lot of their Transformers plans. A seventh film was pulled off the release schedule, and Michael Bay's further involvement in the franchise has become unclear. But one thing that has not changed is Bumblebee, a prequel spin-off film starring Hailee Steinfeld (The Edge of Seventeen), and directed by Travis Knight (Kubo and the Two Strings). While I am not a Transformers fan in the slightest, this is one I've actually been mildly looking forward to. I love Kubo and the Two Strings, and so I was excited to see Knight's next project anyways. Plus, Hailee Steinfeld became one of my favorite up-and-coming actors after The Edge of Seventeen. It also seemed like they were going in a complete different direction than the Bay movies, so I've been curious to see how the spin-off would turn out. 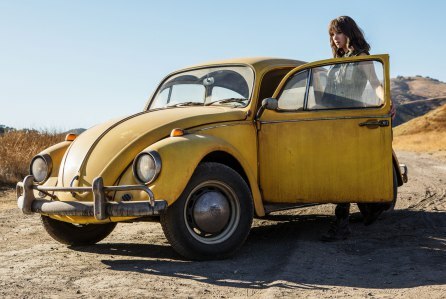 And now we have our first trailer for Bumblebee, which opens in theaters on December 21. Yes, this looks like a cross between E.T. and The Iron Giant, but I'm surprised by how much I actually got into this trailer. They keep pressing the word "adventure", and that's what this feels like. It looks like a fun, episodic adventure that doesn't really have any strong franchise tie-ins. And I think that is a smart decision on Paramount's part. It's a way to get people excited about the Transformers franchise again, as well as bring in new fans who may not have seen any of the other films, like myself. It's going back to the basics, and telling a simpler story. It also seems like it will be more character-driven, focusing on the relationship between Steinfeld and Bumblebee, with the action sequences coming secondary to that. Knight did that very effectively with Kubo, and hopefully he can pull it off here with Bumblebee. It's not apparent from this trailer whether this movie is actually set within the existing Transformers universe. The biggest indicator was going to be Bumblebee's design, but he looks different as he is inhabiting a different car. So could Bumblebee be the first film in a rebooted Transformers franchise? I hope so. These movies have so much potential, and they've suffered from being hung up on Michael Bay for so long. Now that he's out and they have some new talent behind the camera, Bumblebee could be the start to a whole new series of awesome Transformers movies. There's still a chance this is tied into the old one, but I hope it's not. Overall, I'm actually looking forward to Bumblebee, and I hope it turns out to be good. What do you think? Did you like the first trailer for Bumblebee? Are you planning on seeing the film? Leave your thoughts in the comments section below.